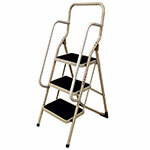 Grey and black folding steps with a choice of 2, 3 and 4 slip resistant treads. 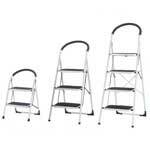 EN 14183 compliant and TUV tested/GS approved. 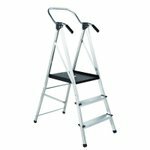 We have a huge range of Kick Steps / Roll along steps, Stepladders, Office Steps, Warehouse Steps, Mobile Safety Steps and even Stainless Steel steps for use in hygienic areas. 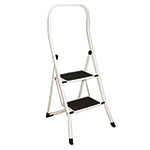 If you need safe and stable steps to reach stored items on high shelves, we’re confident you’ll find exactly what you’re looking for in our excellent range of warehouse safety steps at ESE Direct. 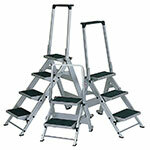 Like, for example, our all weather, heavy duty Handy Steps with durable, injection moulded treads. 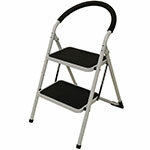 Available in one- or two-step models, these powder coated steps are stable and hard-wearing, and can be purchased with an optional vertical safety post. Or our Tilt and Pull Office Steps – these all-weather powder coated steps are fitted with non-slip, non-marking rubber feet at the back. 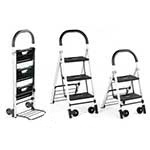 Their non-marking 75mm wheels at the front enable these lightweight steps to be easily manoeuvred, simply by tilting them forwards and pulling. 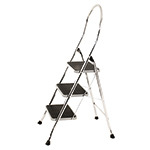 We also stock heavy duty moulded plastic steps in tough, medium density polyethylene, and Glide Along Mobile Steps with handrails in three, four and five tread models.